The big discussion over the past year for endurance athlete’s diets have been around 2 subjects. Firstly, we have low carb/high fat diets and secondly, ketone supplementation. Although related in many ways these are distinctly different issues when it comes to diet, therefore this article will layout the pro’s, cons’ and darn right lies about these dietary interventions based on the latest ‘Hard Evidence’ rather than pure opinion. What are Ketones & What do they do? Ketones are generated from the partial breakdown (oxidation) of fatty acids, and include acetoacetate (AcAc), Acetone and Beta-hydroxybutyrate (BHB). These are produced in the liver (ketogenesis – Main Ketone is AcAc) primarily as a result of fasting but also nutritional manipulation of carbohydrate intake e.g. low carb intake = increased ketone production. Although the main source material is free fatty acids from body fat (Ketolysis – Main Ketone is BHB) we also have a small percentage (<5%) of circulating ketones from the ketogenic amino acids leucine, lysine, phenylalanine, isoleucine, tryptophan, and tyrosine. The response of producing more Ketones is to provide an alternative fuel for the loss of glucose (low carb intake) from the diet. In those taking on board a normal (non carb restricted) diet the contribution of Ketones to energy production in the muscle is small (<5%). However, this can increase during fasting to 10% after an overnight fast and 20-50% after 72hrs of fasting but declines after 24 days. This suggests there is a limitation in the amount of ketones that the muscle can actually use as a fuel source. As such this is important and will have implications for discussion later regarding Ketone supplementation. Although there has been research into the impact of training much of the trials have been difficult to interoperate due to athlete’s individual dietary practices as well as variations in training. However, some early data gives us clues as the where ketones are most used as defined by the levels of enzyme (BDH) that transform BHB to AcAc (See above). Research from back in 1974 (Winder et al.) has shown that the highest levels of activity in BDH are in our TYPE 1 muscle fibres – that’s our endurance muscle. With the lost levels of activity in Type IIb – our sprint fibres. The same author demonstrated 12 weeks of running in these rodents increased BDH by 3 fold compared to untrained controls. Similarly, the protein that transports ketones into muscle from the blood is also highest in Type 1 muscle fibres (Bonen 2001). It is therefore likely that the clearance (take up) of ketones from the blood are greatest in those that are aerobically trained and thus have a higher proportion of Type 1 fibres and related oxidative capacity (Svensson et al. 2016). COMMENTARY: Just as a note here we are providing a distinction between ‘FAT’ use during exercise and ‘KETONE’ use. These are 2 different fuel sources and in the media and posts by so-called experts on sports nutrition they are often confused. So what about Ketone and Fat use during exercise? Most of the existing literature has focused on Carbs and Fat and the general consensus is that as exercise intensity increases the contribution of not only shifts towards carbohydrate but also from peripheral (blood) stores to central sores of fats, intramuscular triglycerides, and muscle glycogen. However, this pattern is readily altered by nutritional manipulation such as high carb intake, low carb high fat and periodization such as carbs morning and fats protein later in the day or indeed intermittent fasting (Robinson & Williamson, 1980; Laffel, 1999). The latter has been well known to result in increased Ketone use (Owen & Reichard, 1971; Elia et al. 1990) as has exercise (Johnson et al. 1969; Johnson&Walton, 1972;Rennie et al. 1974; Rennie & Johnson, 1974a).). Indeed there has been shown a five-fold increase in ketone use during exercise (Evens, Cogan & Egan 2017). Despite these issues when looking at any research or guru articles suggesting increasing ketones by supplementation or other dietary manipulation you will need to also consider that other factors such as metabolism, training status, and exercise intensity, which will all impact our ability to use ketones as a fuel source. So lets look at some actual ‘evidence’ rather than ‘hearsay’ on how the body can use ketones but more specifically the differences between ‘supplementation’ (Ketones taken in a concentrated dose form from a drink, food or capsule) versus Ketonaemia (increased ketones in the blood) that occurs from their release from inside the body as a result of fasting or a low carb diet. DIETARY MANIPULATION AND KETONES: LOW CARB, HIGH FAT OR FASTING? One of the key issues of ketone use by the muscles (we are taking about muscle here as that’s what moves us during exercise) is our ability to use them. If there is not limit great then matching intake to utilisation is a simple issue. However, this is not the case and research suggests some significant limitations to the ability of working muscle to use ketones as an energy source. The removal of ketones from the blood is an indication of how the muscle can use them as a source of energy. In technical terms this is know as the ‘Metabolic Clearance rate (MRC)’. At low levels of ketones in the blood (such as achieved during an overnight fast) we see resting (rest not exercise) MCR is higher then achieved during prolonged fasting (Fery & Balasse, 1983). In fact overnight fasting results in a 2-10% contribution of ketones to energy production (Hagenfeldt & Wahren, 1968; Owen & Reichard, 1971). Importantly during exercise at low to moderate intensity (post fasting) MCR increases 5-75% (Fery & Balasse, 1983, 1986), suggesting exercising muscle has an ability to increase its ability to use ketones as a source of fuel. However, where ketone exceeds 2.5mM (5 time that of a resting level) as achieved from 72hr of fasting ketone contribute a negligible amount to energy provision. This suggests a limit to the contribution of Ketones to energy contribution and as levels increase the ability to use them as an energy source (oxidise them) is diminished i.e. a threshold level. However, these are acute studies relying on fasting over a few days. There is an argument that changes in the level of Ketosis brought about by dieting or by supplementation may impact this ‘threshold’ however, the data is week but lets explore. A lesson I learned from my PhD professor was to consider the ‘normal dietary’ experience when looking to interoperate how the body may adapt to a certain intake of a nutrient, the amount of that nutrient and importantly what the physiological rationale could be as to why we use nutrients in a certain way. This form of thinking is not new we have all heard of ‘evolutionary’ theory of Darwin and to that end the human body is an amazing thing and adapts to its surrounding (diet, exercise etc). So when we think of low carb diets we should consider if we are physiologically cut of for such a diet. What is clear is that at rest fat is dominant fuel representing circa 50% of our energy needs (Owen & Reichard, 1971; Elia et al. 1990). Similarly, as we become glycogen (carbohydrate) depleted through reduced dietary intake of sugars or prolonged low-intensity endurance exercise (where sugar intake does not meet demand by the bodies muscles) then the body increases its utilizations of fats to compensate. It would therefore seem that as an evolutionary mechanism the body has adapted to effectively utilise fats as a fuel source when carbohydrate rich foods are scarce. However, since the increase in agricultural (rather than hunter gatherer) sourcing of foods there has been an increasing shift towards sugars and carbohydrates as a proportion of daily food intake, exacerbated by government guidance on what foods should be consumed. The result for the most part can be argued to be increases in obesity and high sugar consumption related diseases such as diabetes. One hypothesis maybe that the body is better adapted to a higher fat consumption from the diet as we spent more of human evolution eating meats and fats than we did refined sugars – simply put the body has not evolved to process a high sugar diet. One of the major issues in the wonders espoused by many converts of the low carb diets we must consider such comments in context. In that regards I see context s meaning, “what is low-carb”? Is it simply <20-50g per day of carbs (Very low calorie diet – VLCD)? What about levels of fat? What about protein – protein being important as its insulinogenic (causes the body to produce insulin just like when we use carbs). This is important as looking at carbs alone in the general population an intake of 50-150g/d (Low Carb Diet – LCD) would not result in urinary ketones a marker use to suggest adaptation or ‘metabolic switching’ from carb use to fats. We then should also consider are these levels <50g / d suitable for the exercising athlete? Such low intake could result is the equivalent to a negative carb intake as we use carbs to fuel exercise, so would a 100-150g or more be equivalent to a <50g/d LCD? It should also be noted that circa 200g of glucose per day could also be manufactured by the liver and kidney from dietary protein and fat (some from their breakdown and use of carbon skeletons). In my own view the jury is out as we do not have enough published studies to demonstrate what levels of carbs are allowed in competitive endurance athletes training intensely, whist still entering into a state of ketosis and/or achieving the suggested benefits from being on a LCD. In sedentary controls, there are circa 8-10 studies that look at metabolic changes from low car/high fat diets but these studies have very small subject numbers (5-24 subjects) and over a short duration (2-14 days). More importantly they are not in athletes, which is the focus of this article. In athletes, we have perhaps relevant research spanning 40years but still very limited in its application to real life performance. These studies have included exposure to VLCD (<20g/d Carbs), high fat (80% of dietary energy) (Phinney et al. 1983) or a restricted CHO (15-20% of energy), high fat (60-65% of energy)(Lambert et al. 1994; Goedecke et al. 1999) as well as short-term adaptation to a high fat diet and 1 day of high Carb availability ((Burke et al. 2000, 2002; Carey et al. 2001; Havemann et al. 2006). In endurance athletes, irrespective of all the claims made on social media regarding the benefits of Keto diets there have only been 2 interventional studies (Phinney et al. 1983; Burke et al. 2017) and two cross sectional studies comparing ultra-endurance runners/triathletes who have chosen this eating style with similar athletes following higher CHO diets (Volek et al. 2016; Webster et al 2016). The only one of these studies to measure performance or where undertaken at an intensity relevant to endurance completion was that of Burke et al. who investigated a 3-week intervention of a LCHF diet for 3 weeks in world-class race walkers (65ml.kg-1 vo2max ‘Personal correspondence with Dr Burke – please note these are pre-season values so not peak’). I will discuss the Volek et al. study as it is well referenced as evidence of the benefits of the LCHF diet but let’s for now concentrate on the only performance assessing study. In the Burke study, there where 3 groups studies – these comprised of high carb group (HCHO -8.6g/kg CHO & 20% FAT), a low carb high fat (LCHF – <50g/d CHO & 70-80% fat) and periodized diet of high and low carb intakes (PCHO – 8.3g/kg CHO, 2.2g/kg Protein, 4.7g/kg FAT) conducted during 3-weeks of intense training with performance and blood tests take before and after the 3 weeks. The tests included a 10km race walk and a 25km standardized pace test to look at how the body uses fats, carbs and oxygen as well as blood levels of ketones, glucose and lactate (calculated from pre-diet walking test). All groups had the same level of calories. The results of the study showed an increase in the ability of the body to use fats as a fuel source in the LCHF group, however this came at an increase cost of oxygen uptake (i.e. use of a high % your aerobically capacity at X race speed). In essence the athletes became less economic whilst on the LCHF diet yet in the HCHO and PCHO the oxygen demand decreased suggesting these diets resulted in the athletes becoming more economic. However, the important factor here is ‘performance’ and the results from the 10km walking race demonstrated faster times for the HCHO (6.6% improvement), PCHO (5.3%) yet no improvement in the LCHF (-1.6%). There is an issue here though as the high fat group where provided high fat during pre and during the performance tests. However, its likely in most LCHF dieting athletes they still use cabs pre and during the event as such it could be argued that the study in this regards set up the LCHF group to fail in performance improvement. So what can we take from this other than low-carb high-fat does not enhance performance and hi-carb does? Well a few interesting bits of information stand out, 1. High Fat diets make racing ‘feel’ more difficult, 2. High Fat results in greater levels of fat oxidation than high carb and periodized groups, 3. 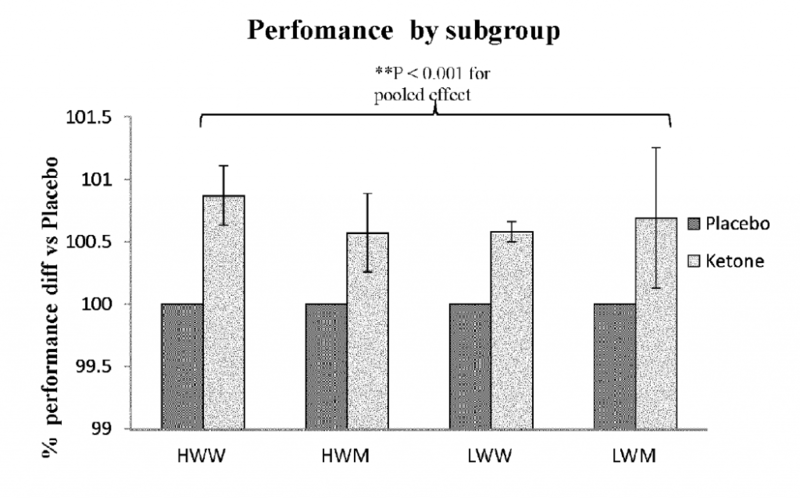 Athletes had to work at higher percentage of their maximum to sustain higher speeds whereas the high card and periodization groups did not. The down side for applying this research to triathlon (half and full distance) is the testing in this study was 10km and 25km, both of which did not exceed circa 2hrs in duration. For most age groupers and elite triathletes we are around the 4 hr mark for half and 8hr> greater for Ironman. As such given our natural Carb stores (blood glucose, muscle and liver glycogen) can last for 2-3hrs (at race pace for most top end age groupers 3hrs> at high intensity) then this study would be examining subjects during an event where glycogen depletion does not occur. As such what happens to the fat adapted athletes in Ironman racing? Is there a benefit to tap into fats as fuels? Another issue is body composition? These days there are a lot of fat triathletes sitting on Pro value bikes. Shedding some lard would be invaluable. I will talk about this are a little later on but there is no doubt the LCHF diet results in massive weight loss especially around the mid-section. What bout long-term adaptation to High Fat? One of the criticisms of the research on high fat diets so far has been the fact most look at only short term <4-6 week of a high fat diet. However, in 2016 one of the most active researchers in this area Dr Jeff Volek published a study that looked at Ultra-endurance athletes and great for us also Ironman Triathletes (Known as the FASTER study). In this study, they looked at subjects who had been following a high carb (>59% CHO) vs. low carb (< 10% CHO & >70% Fat) diet over a 9-36 month (20 Month average) period. They had these athletes perform a max test, then following a high fat (81% fat, 5% CHO) or low fat (36% Fat, 51% CHO) drink a 180 minute sub-maximal (64% Vo2 max ‘that’s about 74% Hr Max) and looked at rates of fat use and contribution to energy production, levels of muscle glycogen (our stores of carbs) pre and post exercise (fat adapted took fat drink, carb adapted took low fat drink). The results are very interesting with come important implications for age groupers and Pro athletes. The results showed at rest the fat adapted athletes had 95% of energy contribution from fats and carb adapted only 47%. Similarly, peak levels of fat use where 2.3 fold higher in fat adapted athletes, which also occurred at a higher (70.3% vs. 55%) percentage of the maximum vo2. Similarly, during the sub-max test fat oxidation was 59% higher in the low-carb / high fat group than high carb. The most interesting part of the study was that resting and post exercise muscle glycogen was not different between the groups, and there are a variety of chemical pathways that could be utilised to replenish glycogen such as lactate carbon skeletons. In the latest study and 1st to demonstrate some performance benefits of the High Fat Low Carb diet is that by McSwiney et al. 2017. In this study 20 endurance trained males (4 of which were Ironman athletes) whom where currently following a standard endurance diet (50% of cals from carbs). The athletes underwent 12 weeks of training a diet that was followed following guidance from a nutritionist to follow a high carb (60% carbs) or high fat (77% fat) low carb (<50g/d) diet and both to meet daily energy requirements. A food diary was checked each week to ensure the athletes where following the diets. The training followed was the same for each group and was 7+ hours of endurance training as well as 2 strength session and 2 HIIT sessions. The participants completed 2 performance tests of a 100km time trial to be completed as fast as possible and also a six second sprint (carried at at end of TT test to represent a sprint to the line), and a critical power test (CPT). These tests were conducted pre and post dietary and training intervention with the High Carb group consumed 30-60g per hour during the test and the high fat group water and electrolytes. There was a significant decrease in body fat and body mass in the High Fact compared to High Carb group. There was however, no significant different in 100km TT performance but unexpectedly a greater improvement in peak power (but not average) in CPT, likely due to changes in weight to power (greater weight loss at end of study in high fat group). .
A number of interesting issues here include a 4.4kg loss in body fat in the high fat group vs. 0.7kg in high carb. Despite no significant change in performance in the 100km TT test (significance based on statistical analysis) may be due to the large variation in response between participants and with greater numbers there may have been a ‘statistical’ benefit. If we just look at actual time of the TT test the high carb group completed the TT 1min and 13secons faster than their pre 12-week dietary and training intervention but the high fat group was 4min and 7 seconds faster. Although you could pull some positives from the study the issue here is 6 second sprint and the subject number could easily account for such an effect. In addition, the way the subjects where selected into each group could have been of issue i.e. not selected according to fitness and indeed the groups where significantly different between body fat and carb intake. Such issues could have impacted the results of the study and clearly more work is needed. There are some other details which are not clear as it states 30-60g/hr where taken in the High Carb group during the post intervention test. However, how many where on 30 and how many on 60g? Was this optional? Where both groups fully glycogen loaded pre-tests? There are still many issues not clear and need to be addressed in future study designs before we can draw any firm conclusions. Conclusion: So at this point there only 1 real ‘published’ performance data to demonstrate high fat diets work better than high carb (McSwiney et al. 2017) and one performance study demonstrating no effect (Burke et al. 2017) as well as a restriction in the adaptive response to training as well as subsequently performance. Yes we see in both studies from the likes of Burke, Volek and McSwiney elevations in Ketones (offering an alternative fuel source to glucose) from fat adaptation but the correlation to exercise performance still is jury out. There is still a gap in our knowledge here for the potential of using high fat diets, and this relates to long term adaptation, its use in ultra-endurance events where fat reliance is put to the test, and also the impact of protein intake, and high fat as primary diet but carbs used during competition in this equation. In relation to the latter from what I have seen from many athletes is what they can low carb is really high protein, low fat and low carb. We need to remember protein is insulinogenic and as such can deliver many of the benefits (although not efficiently) as carbs. Personal view: I tried the high fat diet in 2016 for 5-6months at the early part of the season (less intensity more volume and L2 work) and I have to say the effects on huger and body composition are astounding and as such as a health option and ability to alter body fat levels there maybe some significant scope for play. However, as you move into doing higher intensity work and much glycogen levels are depleted to a greater extent the high fat diet for me falls short as your either 1. Not able to carry out higher intensity interval work because your glycogen depleted (this would go against the Volek study suggesting no difference in CHO repletion rates) or 2. There are some metabolic changes that occur due to a high fat diet that inhibit the ability of the muscle to function and/or adapt to working at and above your threshold. My other thoughts are for those in the pointy end of half and long distance triathlon is that your already highly fat adapted. Your training 2-3 times a day which often leads to low muscle / liver glycogen levels (the same result as fasting and low carb diets). The result would be many of the adaptive responses seen metabolic from the FASTER study. I would advise if you want to try this diet then try on the off season or even better try a periodization approach of high carb immediately post some higher intensity sessions, mixed in with a few fasting and longer low carb endurance rides. Care must be taken on manipulation of your diet with low carb as there are risks of immune suppression and that can mean greater susceptibility to infection/illness. I want to start by saying Ketone supplementation is nothing new and in fact has more research underpinning its use as an intervention than high fat low carb (HFLC) diets. It’s been around at least since the early 1970s, where we see studies using ketones ingested as a means to bring about nutrition ketosis (high blood Ketone levels)(Johnson & Walton 1972). With more recent trials using β-hydroxybutyrate (β-HB) and acetoacetate(AcAc) and (R)-3-hydroxybutyl (R)-3-hydroxybutyrate (ketone monoester). These lovely sounding chemical names as with the high fat low carb diets are also limited with reference to performance despite the mechanistic possibilities of an effect. So in this part of the article we again will look at separating hype from fact and if these supplements are 1. Performance enhancing, 2. Legal and if they offer any benefits to triathlon performance. As we have seen with the studies above Ketosis (elevated blood ketones) can be achieved endogenously (produced by the body in response to low carb intake) but it may also be achieved exogenously through Ketone ingestion or infusion (injected directly into blood stream). There are 2 potential ways Ketones maybe beneficial to endurance performance from an energy standpoint. First, its an alternative fuel source as to be used to spare muscle glycogen (however, there is a view that this may indeed result in decreased capacity for high intensity exercise), secondly, it has the potential to be an more efficient in supplying energy than from the breakdown of carbohydrates. However, these are primarily theoretical consideration and or based on rodent models (trials). There are also a number of metabolic effects that maybe of use such as increasing the rate of glycogen replenishment post exercise (i.e. faster recovery), and improving recovery through increased protein synthesis. Again there are studies both for and against such mechanisms so lets look closer at performance. Despite a significant amount of papers on possible mechanisms and biochemistry of supplementation with Ketones, as with high fat low carb diets there are almost no studies on human performance. To date there are 3 studies relevant to triathletes and endurance exercise. The 1ST study is not even peer reviewed (i.e. not assessed by another independent academic and them published in a science journal), and was indeed part of a patent submission back in 2013 (Clarke et al. Patent Application. June 18, 2015; 20150164855 A1). In this study a solution containing circa 230kcal from ketones where taken prior to 30 minute rowing test. Performance outcomes included distance in m, and seconds to complete 2 km trial. The improvements where modest at best in this group of elite and sub elite rowers, with a reduction in times of 1-2% according to the patent (see figure 1). Figure 1. The effects on rowing performances from ketone drink in heavy and light weight male an female rowers. Accepted for publication in May 2017 the next study (O’Mallet et al. 2017) took 10 healthy males (note healthy i.e. not trained) undertook some lab sessions to get use to the tests there where going to do (i.e. you get a big jump in FTP test results in second test than 1st as you learn to pace better rather then physical performance increase). Subjects reported to the laboratory in the fasted state and consumed either 0.3 g/kg ketone salts (beta-hydroxybutyrate) or a flavour-matched placebo at 30 min prior to engaging in cycling exercise. Subjects completed steady-state exercise at 30%, 60%, and 90% ventilatory threshold (close to lactate threshold) followed by a cycling time-trial. The respiratory exchange ration (a measure of fat use the lower the great fat contributes to energy) was 30% and 60% lower at VT in the ketone compared with control condition. Total fat oxidation was greater in the ketone versus control. Average time-trial power output was 7% lower in the ketone condition. Ingestion of ketone salts prior to exercise increases fat oxidation during steady-state exercise but impairs high-intensity exercise performance. In October 2017 a paper was released which is more inline with triathlon performance and was actually peer reviewed (Leckey et al 2017). This study took 10 elite male cyclists and had them complete 31km lab based time trial (tria lasting circa 50mins). The cyclists consumed on the evening and morning of the trial a meal containing carbohydrates of 2g/kg bodyweight. The morning of the trial cyclists also consumed 200mg caffeine with their meal. Prior to the trial they where then provided either placebo or 2 x 250mg/kg (dose 20 mins apart) ketone (1,3-butanediol acetoacetate diester) drink and 200ml of diet cola 30 mins before a 20min warm up then the TT. Participants also ingested 250mL of commercially available 6% CHO drink (Gatorade) at 15.74 km. The trial was conducted again and the intervention was swapped (i.e. those who had ketones the 1st time around would have placebo and vice versa). The results of the trial demonstrated a 1-3% decline in performance that was associated with gut discomfort (all subjects given ketones reported this and none on placebo) and a higher perception of effort. There are a number of issues here and it seems the researchers have jumped ahead of a more logical approach to investigating ketones. Because the trials involved what is in effect a multi-nutrient mixture i.e. taking on board carbs and caffeine as well as ketone we don’t know if the issue of GI distress was ketones alone or due to the combination. Similarly, we also do not know what impact ketones alone would have on performance. What the study does demonstrate is that utilising current dietary race strategies and dumping a new ingredient into the mix has consequences (negative ones) on performance. As such in the real word a more cautious approach should be taken to trial any product starting at lower doses taken alone and graduating the dose up to allow for tolerances and possible adaptation. Example you would not give a new athlete unaccustomed to caffeine 4mg/kg bolus as caffeine sensitivity and tolerance can be markedly different. In addition the ability to use and deliver a performance benefit can be dependant on the intensity of the exercise and its duration so what may not work for a 50min time trial may not be the situation overview a 5 hour sportive or Ironman competition. Supplementation & performance – Time to ‘ReTool’ metabolically? Although Ketone supplementation may not yet have been demonstrated to enhance performance as an ergogenic substance within training, there maybe other benefits metabolically to their use. There have been at least 3 very interesting studies that may suggest some benefits to endurance athletes outside of a direct performance enhancer. Firstly, A study providing high dose ketones plus glucose and measured change in muscle glycogen levels versus a placebo following glycogen-depleting exercise (Holdworth et al. 2017). The results demonstrated the ketone drink increased muscle glycogen levels 50% higher than after the control drink. Whilst these are very interesting the study design is not externally valid i.e. its not representative of the real world. Firstly, all we are looking at here is recovery from total muscle glycogen depletion and for most athletes this level in normal training would not be reached. In addition the change in muscle glycogen was not mealy a result of drinking ketones. The study gave the drinks then intravenous glucose was provided compared post ketone use or following placebo (glucose) or saline control. As such we do not know if actually taking ketones plus glucose orally would enhance glycogen levels, would compete against each other in the gut for uptake or as per the time trial study above in cyclists cause significant gut stress. In another 2017 study (Vandoorne et al) researched investigated the effects of a protein/carbohydrate mixture plus placebo or a Ketone drink on the nutrient sensing protein complex MTOR (rapamycin complex 1). This molecule directly impacts muscle growth and recovery so enhancing its activation suggest improved muscle protein synthesis (growth and or repair). The researchers also looked at muscle glycogen levels following intense one-leg glycogen-depleting exercise (knee-extensions). The results demonstrated no effect on muscle glycogen levels in direct contrast to the study above. However, there was activation of MTOR and also associated muscle protein synthesis. These are interesting findings but again the issue is the study did not measure recovery that has direct bearing in the real word – but that I mean improved recovery time before next training session, increased muscle mass etc. Finally, these where just health subjects and not trained, and the difference in how nutrients are utilised can be very different. This month a study from researchers from Oxford University (Stubbs et al. 2017) looked at the impact of taking a ketone vs. a glucose drink on reported feelings of hunger and hormone levels known to be related to perception of appetite. The results of the study demonstrated increased blood ketone levels may directly suppress appetite, as ketone drinks lowered plasma ghrelin levels, perceived hunger, and desire to eat 1.5hours after consumption. Again this study although interesting to demonstrate a real impact would be to look at its use in a free living diet and if it can help you eat less and thus maintain or loose body weight. These studies are still needed to draw any conclusions. I would start by saying please don’t believe the hype over any diet or food supplement until you have reviewed the evidence. People can become almost religious in their beliefs that x diet or supplement can work. However, take a view 2-3 years later and 99% of those suggesting it was the next miracle product don’t follow/use it anymore. Most that suggest a high fat (80% fat) low carb (<50-100g/d) base their views as evidence on historic diets i.e. what we consumed during prehistoric or Neolithic times. Again what was our historic diet that our genes and bodies adapted too. Well that depends on where you would have lived i.e. near the ocean, access to meat, fruits etc. Outside of Inuit populations there is little evidence that dietary fat intake exceed 35% of daily caloric intake. There is also no evidence to suggest such populations where healthier or lived longer. However, in this article we are talking about performance rather than health and there is no doubt reducing calories and indeed simple sugars from the diet impact health and specifically bodyweight and blood glucose control. From my own experience there is a place for higher fat and lower carb diets but this is very much dependant on the phase of your training cycle, the amount of training you do and even your own individual reaction to foods. It’s clear in my mind higher fat and lower carb diets reduced appetite and help greatly with body fat levels. My own view is that much of this is a result of the fasting component of such diets. Try such a diet for too long, whilst you have multiple training sessions a day, training involves very high intensity intervals or during competition and performance will be reduced and the most recent well-controlled intervention studies support this. In relation to Ketone supplementation we need to separate it out from high fat low carb diets, as there are not the same. High fat and low carb diets result in prolonged (Chronic vs. acute) ketosis as well as other effects from reduced carb intake. The studies on ketones although very interesting from a biochemical point of view simply have to date not stood up to scientific rigor when it comes to delivering performance benefits. The studies are also a mixed bad as they use different subjects (trained vs. untrained, rowers vs. cyclists) as well as different types of ketones. As such I could not recommend that a high fat low carb diet is used as a permanent diet change but early season during endurance build it may have its place in the control of bodyweight and enhancing the aerobic biochemical machinery in our muscles. When it comes to later in the training cycle periodization would be advised at best. As for ketones I would just not recommend for anyone looking to enhance athletic performance, the evidence is poor for benefits, and indeed the gut issues associated with their use can be a significant issue. Outlaw Half 2018 – 1st triathlon of the year!